The first edition of Signs for Deaf Dogs came a from an idea initiated and developed by Suzanne Williams, a deaf dog owner, BSL advocate and Deaf Dog Network (DDN) member to help spread information about dogs who are deaf and also to encourage owners to use some simple hand signals borrowed from the lexicon of British Sign Language (BSL) to aid communication with their pets. There are widely accepted hand signals that are used with hearing dogs. 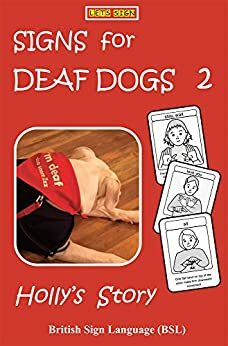 The signs contained in this booklet are aimed at owners and trainers who would like to use or adapt BSL signs for their deaf dogs and also be recognised by deaf adults that use British Sign Language too. 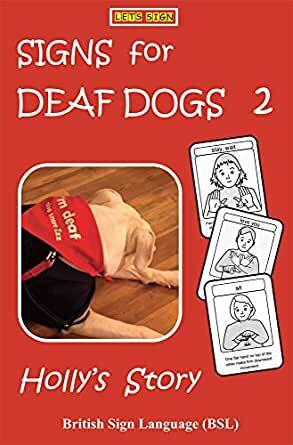 The original 25 signs covered basic needs and this second edition includes an additional 22 signs that have been suggested by deaf dog owners. They are presented one sign per page, clear and simple in flashcard format. This edition is printed in black and white as a more cost-effective way of including more content and is also available on Kindle - ideal for smart phone and tablet. In addition to extra signs, this edition also contains Holly’s Story - a touching glimpse of a sweet natured dog and her adoptive family, who took Holly in when she was unloved and unwanted. My dog is deaf - but lives life to the full! 5.0 out of 5 starsIllustrated Sign Language for your Dog. Looks like it has pretty much all the signs you would need to tell your dog what you want them to understand. This book has changed my dogs bad behavior. We can train him to obey. It took a few weeks for us and the dog to learn the signs, but it is so worth the effort. Great Book! Makes signs very clear so I can teach them to my deaf Catahoula hound girl! Service was great..I think it came within 4 days after I ordered it! Yayyyy!!! I bought this book in the hope of teaching my deaf dog new signs. These signs are not useful when I have to hold a leash in one hand and sign with the other. The signs in the book require two hands to make the signs.